Search engine bias is a hobby horse of mine so I was interested when House of Cards introduced a fictional search engine in the fourth series. If you’re a House of Cards fan, you’ll know that republican presidential candidate Will Conway uses the fictional search engine Pollyhop to gain intelligence on voters’ preferences so that he can get the upper hand over Frank Underwood. Conway is digital media savvy. He’s smart. A fast thinker. He’s not afraid of celebrity and he knows how to make himself and his family the centre of attention. He records family moments on his cell phone and shares them publicly on social media. He’s open. He’s transparent. But it’s his use of the Pollyhop search engine that caught my eye because it touches on the interesting question of search engine bias in our digital age. 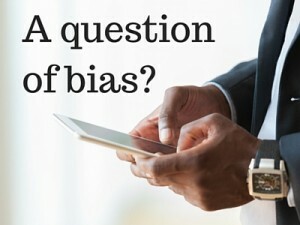 What influences search engine bias? The Internet has become our first port of call for information, entertainment and news. We search. We retrieve results We rarely need to look beyond the first page of those results to find an answer to our question. We rely on search engines to prioritise relevant, trustworthy information and we seldom cast a thought to what’s filtered out. Yet, we know that every time we type a query into a search engine, the results presented are influenced by our previous Internet behaviour — the sites we visited, links we clicked, items we purchased online, our location and a host of other factors — many of which draw on personal data that we willingly shared. Sometimes this personalisation is beneficial when we’re offered a deal for access to the VIP lounge before we fly. Sometimes it’s annoying when we’re emailed about products or services we’ve purchased before or have no intention of ever purchasing. And, sometimes, our search results are influenced by external factors. Swedish author and journalist Andreas Ekström brilliantly explained this using examples of how photo results have been manipulated and the steps taken to address the problem. Check out Ekström’s TED talk and if you’re interested in learning more about how search works, have a look at Eli Pariser’s book, The Filter Bubble. In House of Cards, Pollyhop may be fictional but there are many real life examples of search engine bias. The question is not so much whether search results should be objective but rather whether they ever can be. And, if results are inherently biased, how can we filter and/or augment the knowledge we discover online — effectively optimising results for ourselves to counterbalance the biases of others? I don’t know the answer but the question continues to fascinate me.